Apparently, a car can be sold for $2,500. Well, that's the case with India's Tata Nano car which was unveiled today. The Tata Nano is being dubbed as the People's Car, and why wouldn't it be? For $2,500? Heck, I could buy three Tata Nano cars. However, at just $2,500, don't expect the Tata Nano to be all pimped up, there's no (audiophiles, brace yourself) radio, no air conditioner (on the standard Tata Nano model but available on the deluxe model), one windshield wiper, and no passenger-side mirror. Hmm, wonder if it has airbags? Probably highly unlikely. 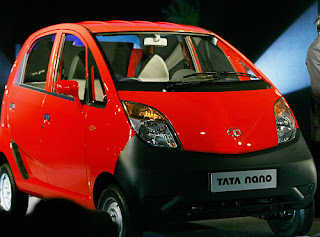 The Tata Nano has two-cylinder,a rear-wheel drive and a 35-horsepower engine which can reach speeds of 60 mph. According to the makers, it will be available in India later this year.